Cleanliness and beauty are visible in every corner of Mrs. Deachi Appaji’s house, situated amidst the lush greenery of Kodugu district in Coorg. 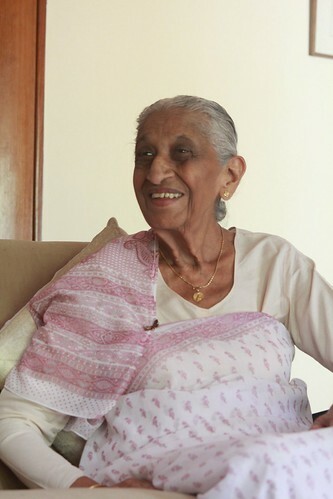 At 86, she is a mother of 3, grandmother of 6, and great-grandmother of 4. She believes that it is important for youngsters to be all-rounders and show dedication, a value instilled in her by her father. A gracious hostess and an excellent home-maker, she is also known to be a keeper of traditions. Her relatives depend on her to remember the traditions pertaining to marriages and festivals. Namaste Mrs. Appaji, tell us about your childhood. I was born in Coorg, and moved to Bangalore and Mysore for some years after marriage, but eventually returned back to my home town. Your family tells me that you are a person of routine. Yes, I like to be routine-oriented and disciplined. Every morning I wake up at 6:30 a.m. I have a bath and say my morning prayers to Cauvery Igguthappa, the main deity of the Kodavas. After this, I prepare breakfast along with my cook, and eat immediately afterwards. Until lunchtime, I clean the house, read prayer books, read the paper, finish ironing, and do some cross-stitching for two hours. After lunch, I rest for an hour. Once I get up, I watch TV for an hour and do some more cross-stitching. I have tea at 4 p.m. and walk for half an hour. In the evening, I have a wash, pray for half an hour, watch TV for some time, eat dinner and go to sleep at 9 p.m.
That almost sounds like a military discipline! My husband, Mr. P.T. Appaji, was in the army, so perhaps that explains my need for discipline and order. So how did you move to Coorg again? He started his career in the army but later moved to Coorg to manage his plantation. He was a friendly and jovial person and made friends easily. Your grandchildren inform me that you have cultivated a lot of craft hobbies! Yes, I enjoy making things with my hands. I find embroidering to be a relaxing activity, and whenever I gift something that I have made, I have always received appreciation for it. I also feel that one must try their hands at a variety of things to truly know what they enjoy doing. (Sapna, Grand-daughter): She has been a caring mother-in-law, a loving wife, an adorable mother, and a wonderful grandmother. She has fulfilled her duties well, be it caring for the elderly or sick, entertaining family and relatives or cooking for family and functions. Her dedication and enthusiasm for life is a lesson for all of us. (Uttam, Grandson): She has many interests besides cooking. I still remember how excited we felt when she scaled the highest peak in Coorg even though she was quite old by then. When she arrives anywhere it is not without her goodies of jams, preserves, juices, cookies, cakes and other delicacies. She is a loving person and her demeanour spreads love to all those around her. Mrs. Appaji, what is the main ingredient of taste in food? I think one must be interested in whatever one does – dedication makes life meaningful. Food when cooked with patience and love is bound to be tasty. I also enjoy cooking with fresh and seasonable vegetables. And what is in season just now? Today, we have prepared a curry with small wild mangoes. It is a famous dish from Coorg and is prepared during feasts. It is sad that man’s greed for valuable timber has resulted in the loss of a great many of these centuries old patriarchs among mango trees. I am sure you will enjoy the taste of this curry. I am looking forward to that. Tell me a little more about your mountain climbing incident! At the age of 65, I went on an overnight trek with a group to Thediyendamol, which translates to on top of a big mountain in Malayalam. Thediyendamol is the highest peak in Kodagu, reaching a height of 5730 ft. The trek was organized by Coorg Adventure Club, a club for local students. It takes three hours to climb, the last stretch of which is a very steep climb. After the trek, our group spent the night under the trees and the stars. This allowed us to enjoy the sunset and sunrise from the hill top, which was a fantastic experience. That is so inspiring. I can almost see the place in your words. I have also gone on a trip to Sabarimalai, the famous pilgrimage centre set in the middle of the mountains in the Western Ghats. This pilgrimage usually happens in the month of January. It is a 41-day pilgrimage which includes severe austerities and trekking up a forested path of almost 14 km. Yes, it is a great pilgrim centre. Mrs. Appaji, can you share your mantra for life! Success comes to those who work hard and smart. Always be sincere in whatever you do, and have faith in your abilities. Thank you so much. It was a pleasure knowing you. First published in Nov 2013 in Harmony – the Indian magazine for silvers for the column – The Great Granny Diaries. Part-2 of this post is Maange Curry, a recipe with wild mangoes from the kitchen of Deachi Appaji. She is the 15th grandma featured in this column.